This writing company has tried to create an editing and proofreading company, but it has turned into a writing company. They promote their proofreading and editing services the most, especially on their pricing pages. 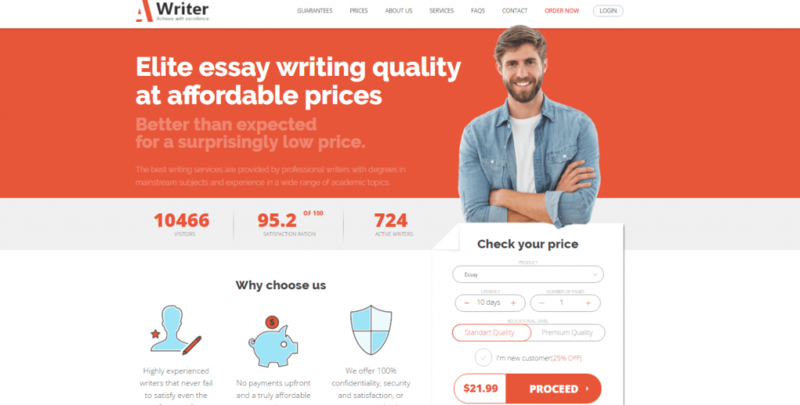 Our essayedge.com review found that this writing company is quite adept at writing essays for higher-level projects and papers, but their prices are both high and confusing. Getting a price for your project is rather tricky, to the point where you may be better off contacting the customer service department and negotiating a price with them. It would allow you to do things such as opting out of the proofreading package, which seems silly if another writer is writing the essay. Finding their price list is very tricky. They do not seem to link to it from their first page. You have to navigate through different options, such as clicking the type of paper you want, before you are allowed to see their price list. They do not have a quoting tool. Instead, they have opted for a written list of prices. They also charge by the word count rather than by the page, so you may find it a little more difficult to compare the price of this company and other writing service companies. For 600 words, you can expect to pay between $60 and $150, but it is very difficult to figure out which prices suit your project. It is possible to navigate around their website and find a series of different prices that all suit your project. They have a range of services that are fueled by their writing staff. They have MBA writers, graduate writers, college writers, medical writers and law writers. They offer a range of services that are mostly geared towards college students. They also offer a sample essay, but many of their projects are so different that it is tough to judge what you are going to get when you finally receive your essay. Here is a short list of some of their services. This is not a comprehensive list of all the things they can do; it simply gives you an idea of what they are able to do. They will write smaller things such as abstracts, resumes, and article critiques, and they will write things such as your scholarship essays, lab report, personal statements, thesis proposals, case study, thesis writing, results, presentations, research paper, term papers, book report/review, admission essays, and literature reviews. They also write up your discussions, coursework, term paper, results analysis, methodology work, research papers, reaction paper, dissertations, introduction chapters, movie review, articles, annotated bibliographies, book reviews, custom essay, and they will complete your book reports too. They have a coupon code that allows you to save $20 on editing. They sometimes change their coupon and what it does, so you can never be sure what discount they will offer when you make your order. If you want their discount codes, you will have to give them your email address and sign up. They do not offer any further freebies so far as we can determine. The team they have in their customer service department is very helpful and efficient. They have a phone number that you can call if you live in the US, and one you can call if you live in another country. They have a chat function, which some people may find useful, and they have a help section that may help you get answers to some/any of your questions. They also have a blog that may answer a few of your questions or ease your concerns prior to making contact with their customer service department.